Why Choose Joyce as your REALTOR ®? Joyce DeLine, Broker associate for Cornerstone Real Estate, has been in real estate sales since 1983. Having moved here from the San Francisco Bay area to attend Cal Poly State University in 1978, she appreciates what the Central Coast has to offer. Her specialty is San Luis Obispo, and beach properties, golf course and gated communities in Pismo Beach (Sunset Palisades), Avila Beach (San Luis Bay Estates), Arroyo Grande, Nipomo (Monarch Dunes, Trilogy), Grover Beach, San Luis Obispo and subdivisions (San Luis Obispo Country Club Estates), Morro Bay, Atascadero, Templeton and Paso Robles. Joyce has taken great pleasure in assisting new clients to relocating to the Central Coast. Real estate is a full time career for Joyce and she looks forward to personally assisting buyers and sellers in meeting their real estate needs. Honesty, Integrity, and experience are key to her success. www.BetterHomz.com - Covers all San Luis Obispo County, San Luis Obispo and Beach cities. www.SellingPismoBeach.com - Covers primarily Pismo Beach, Sunset Palisades, the Bluffs, and relocating to those beach towns. www.PismoBeachHomeFinder.com - Finding Homes for sale in Pismo Beach, subdivisions and gated communities. www.SanLuisHomes.com - Focus is on San Luis Obispo homes, gated communities, country club homes, homes on golf courses, subdivisions, and Cal Poly homes (commercial, multi-family, apartments, condos, possible rental properties. Put a Trusted REALTOR ® to Work for You! 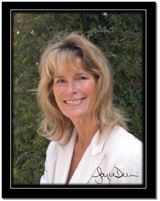 With her expert knowledge of the local San Luis Obispo real estate and the Central Coast, beach front properties market, Joyce DeLine knows how to help you with your unique needs and how to best protect your interests through every aspect of a real estate transaction. She is always focused on providing you with the most personal attention and best service possible. That is her promise to you and your family. We have been involved with the buying and selling of homes in San Luis Obispo and adjacent areas for over 15 years. Since inception, we have been an important part of the local community and we will continue to serve all of the Central Coast's real estate needs for years to come. With over 20 agents in the office working under an experienced licensed broker, all of our staff members are high caliber professionals with extensive experience and knowledge about our local San Luis Obispo real estate market. Our agents come from diverse backgrounds but all are dedicated to providing the highest quality service to our clients. Meet All Cornerstone Agents on the company web site. Our Cornerstone office is fully equipped with an integrated network of computer and communication systems. We have instant access to the regional Multiple Listing Service, Public Record Searches, and many other tools and services that our agents use to better serve you.